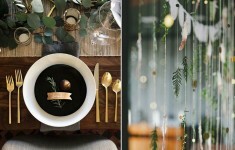 If, like me, you’re a bit of a magpie for inspiration, ideas and pretty I’m sure you’ve felt both awe-inspired and absolutely overwhelmed at the variety and constantly changing wedding inspiration out there? 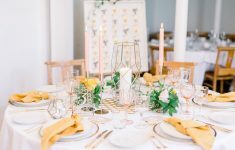 Every week there seems to be a new trend or element to incorporate into your wedding, and with your wedding date looming ever nearer sometimes I’m sure you feel you’ll never quite button down just one concept. 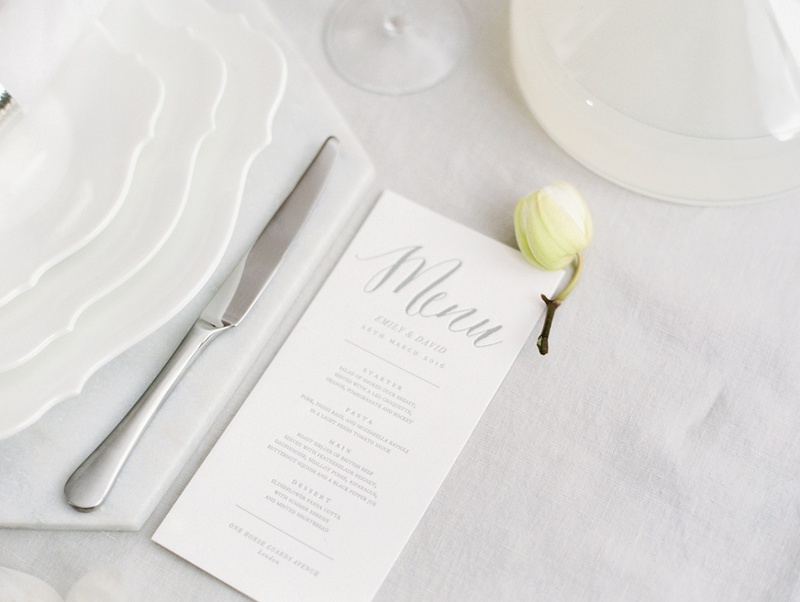 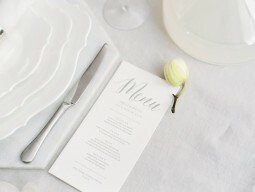 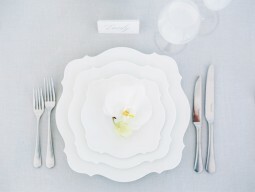 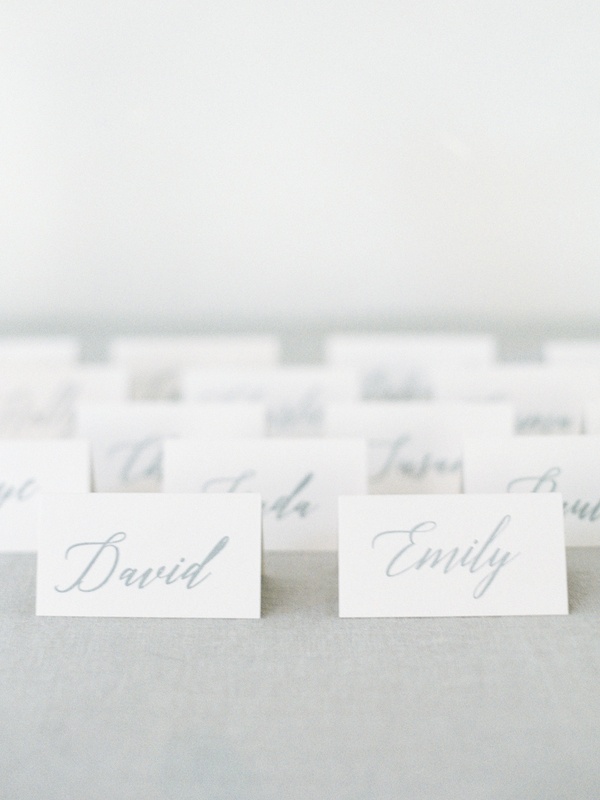 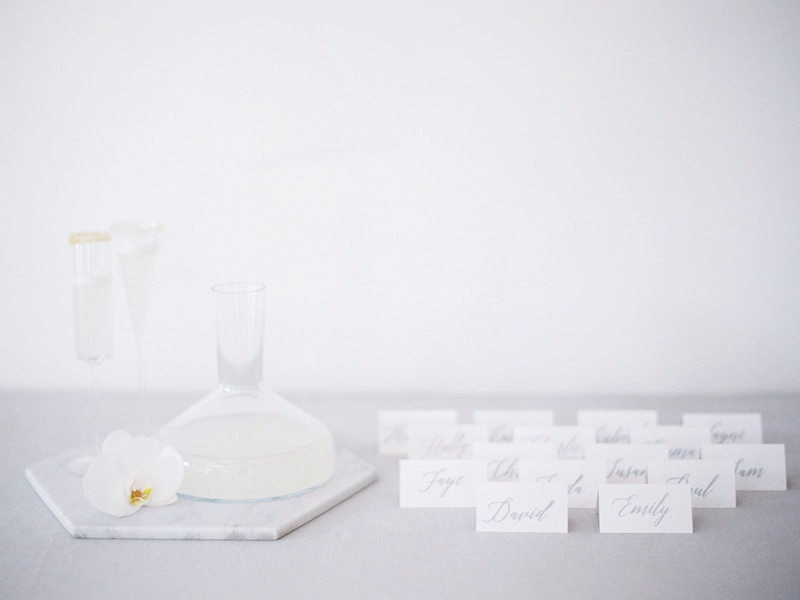 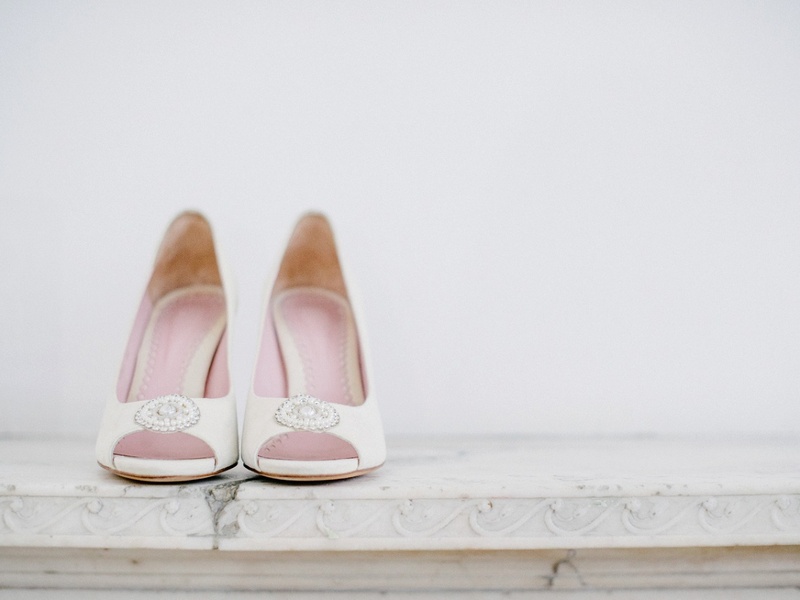 Although pretty details and fresh new inspiration are totally my thing, I’ll admit sometimes even I get wedding-fatigue. 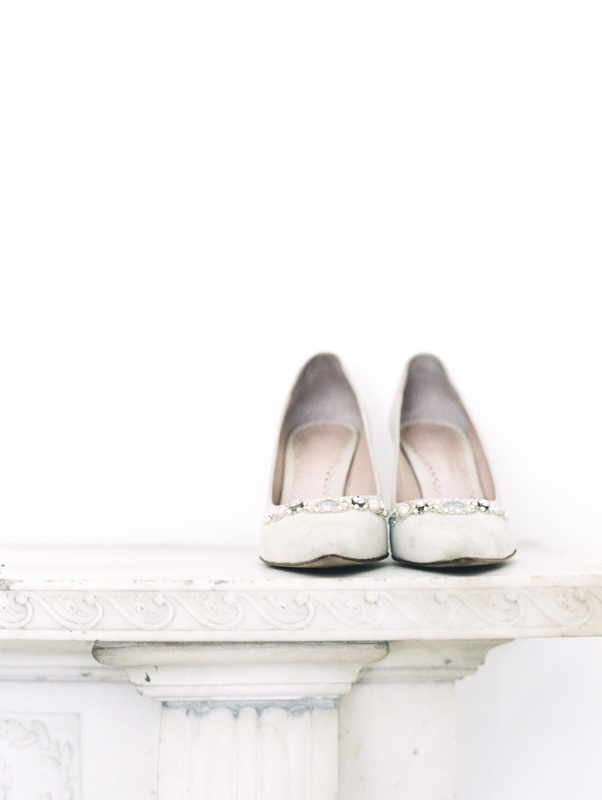 So for the shoot I’m sharing with you today I wanted to strip things back. 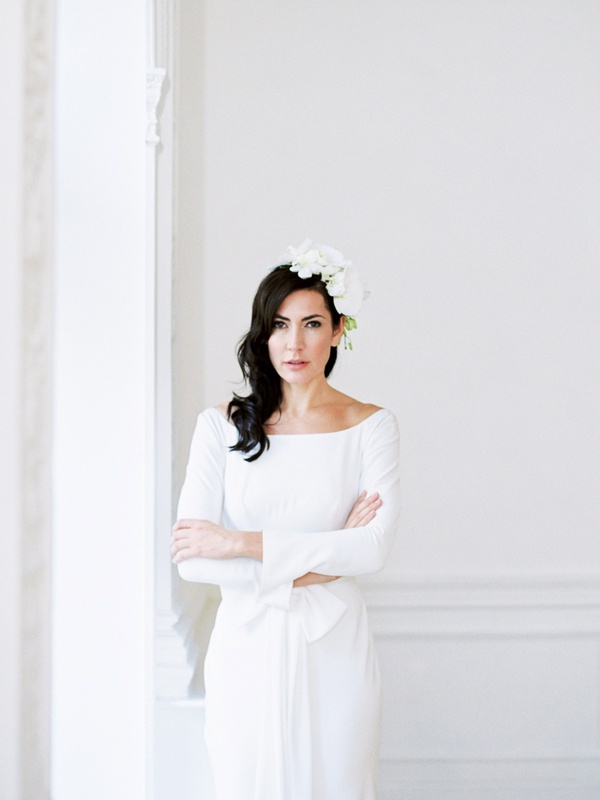 Shot in the all-white, light-filled interiors at One Horse Guards by fine-art photographer Hannah Duffy, it’s the perfect modern fine-art white wedding inspiration for the overwhelmed bride. 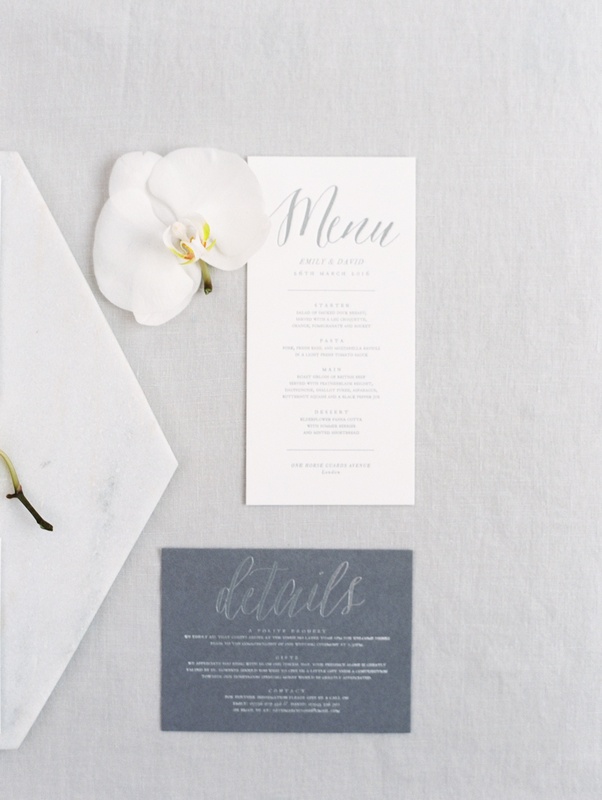 Back to basics, using a one-colour palette, my team of talented pro’s and I created something elegant to show how you can take one simple colour – white and create something that’s still interesting and visually exciting. 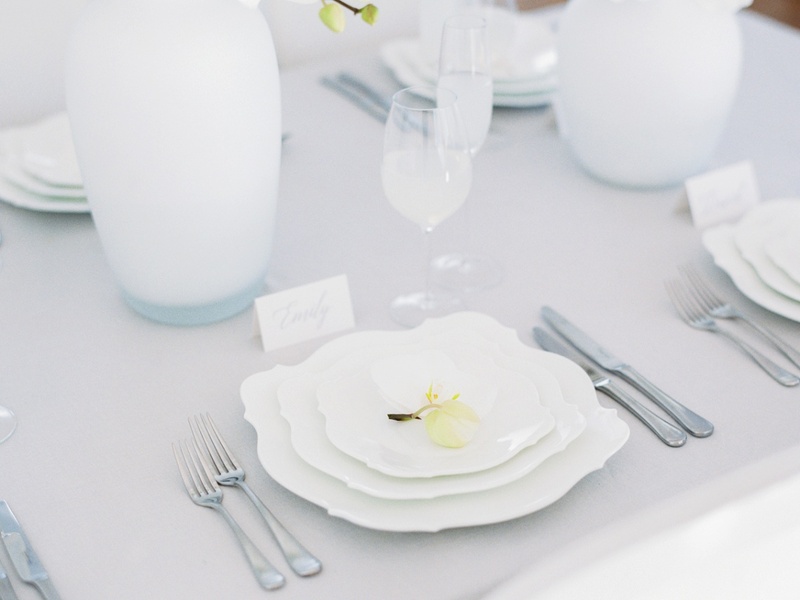 While the design style is super clean and minimal, Hannah shot this editorial on film – a medium full of imperfections and noise, adding texture and life to the images. 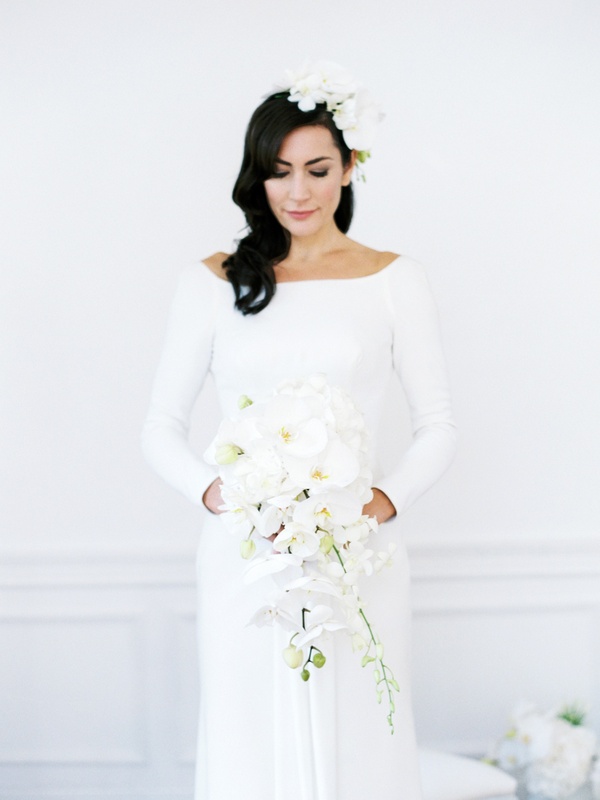 I’d describe the results as modern fine-art, the overall design is contemporary and architectural, with structured bouquets and dresses contrasting with the soft, luminous quality of the photography. 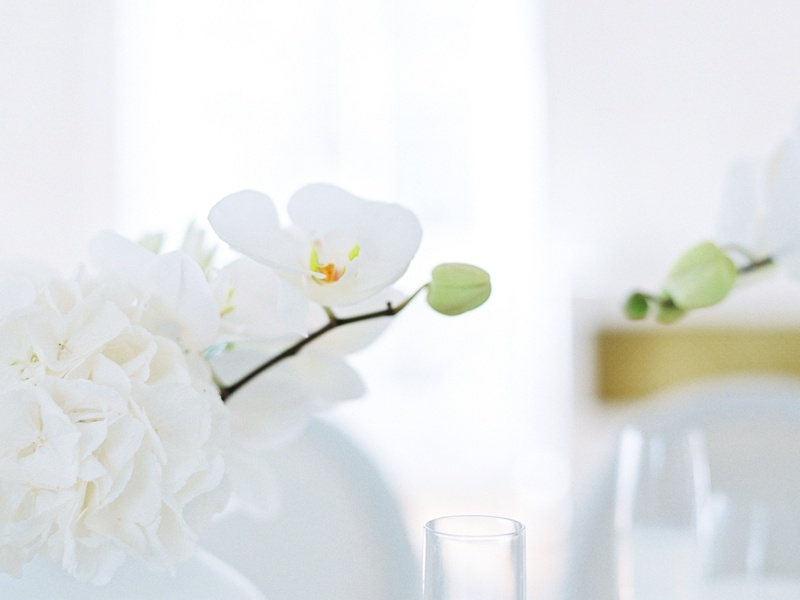 One Horse Guards is a classic London venue with a modern twist. 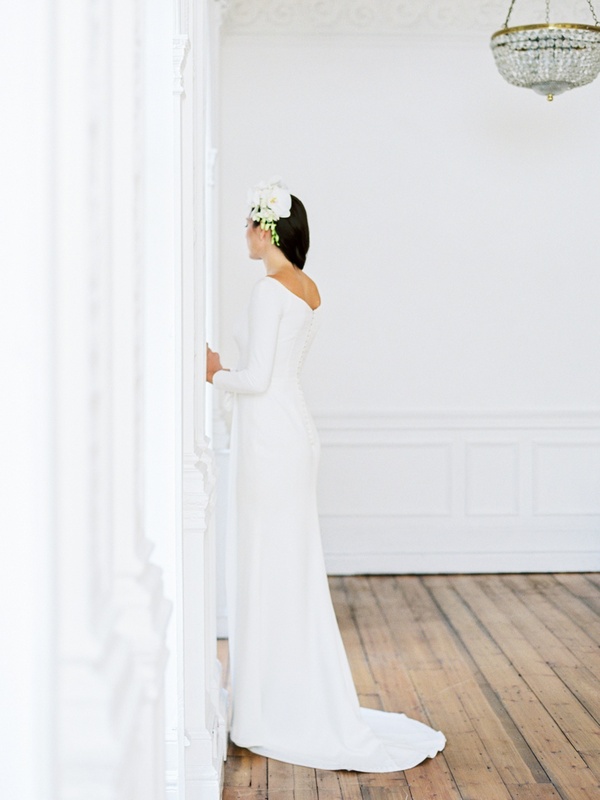 The all-white rooms are filled with original features, with natural light flooding in through the huge windows which was perfect for creating the beautiful, luminous images we were after. 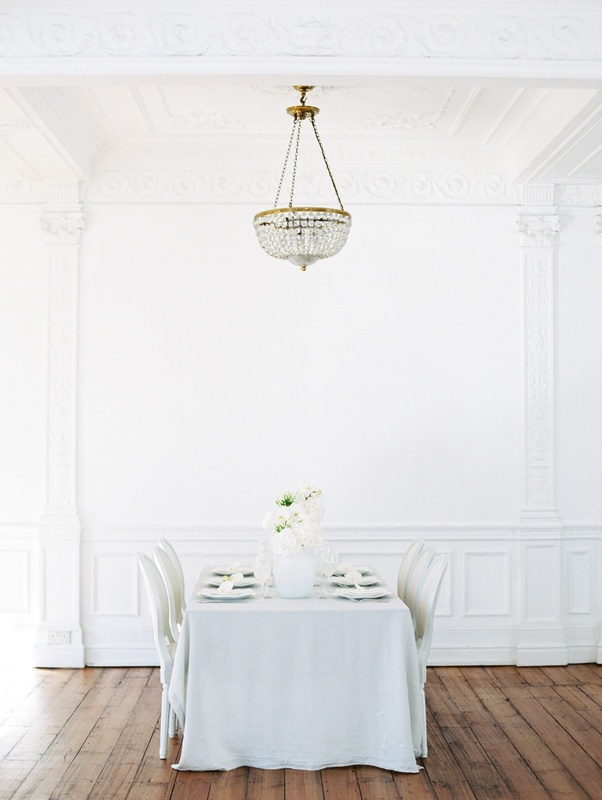 I especially love the huge sparkling chandeliers, which really add a touch of understated glamour. 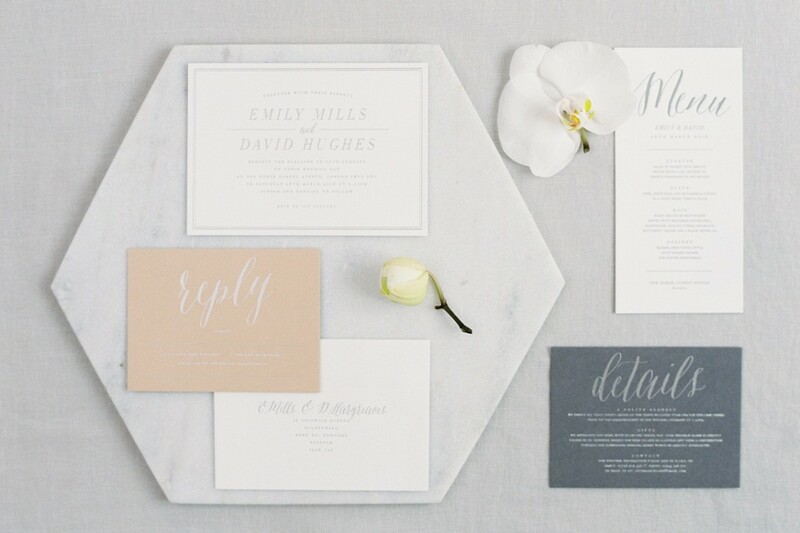 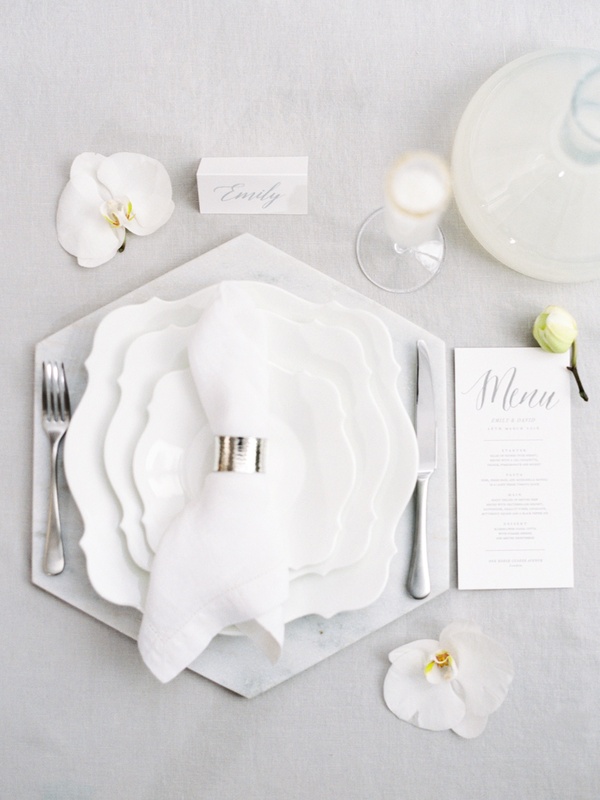 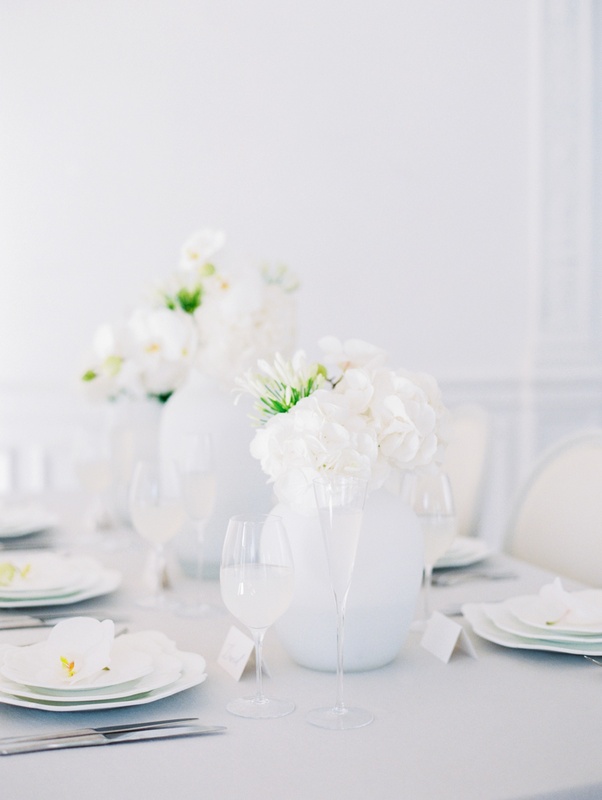 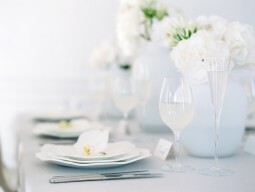 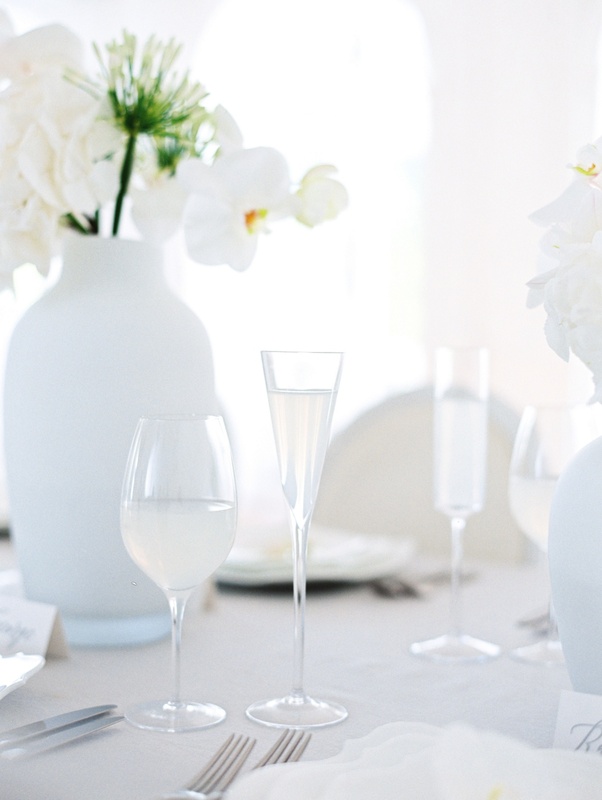 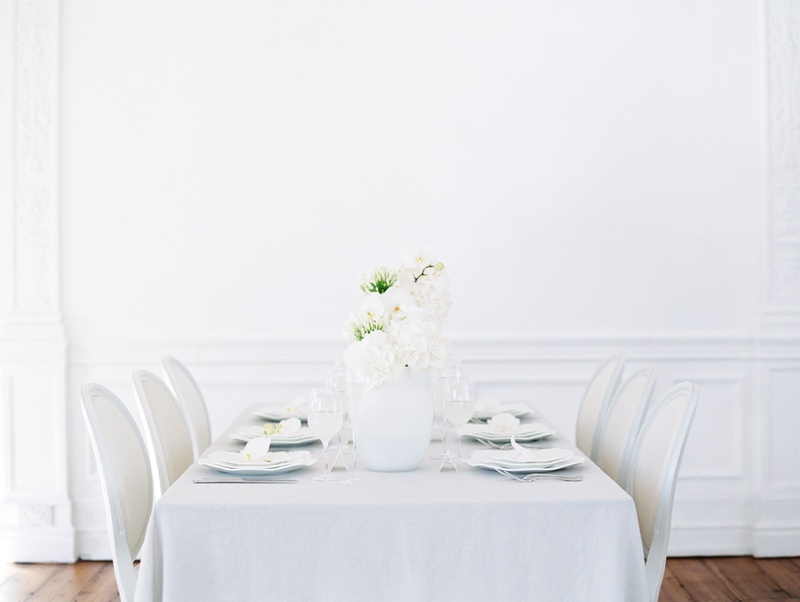 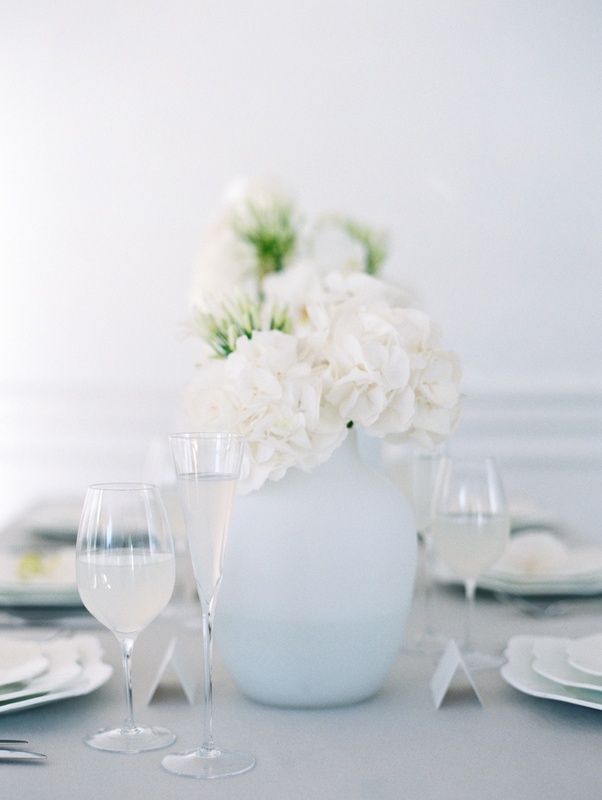 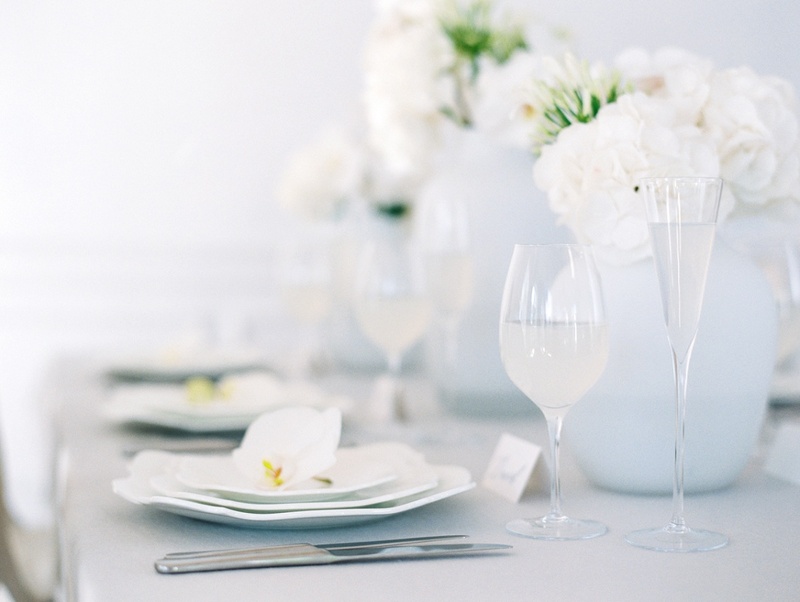 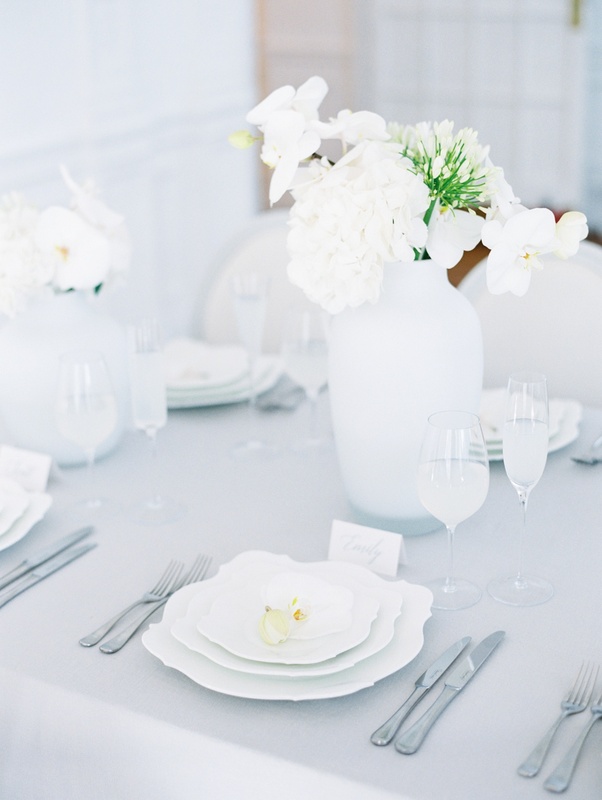 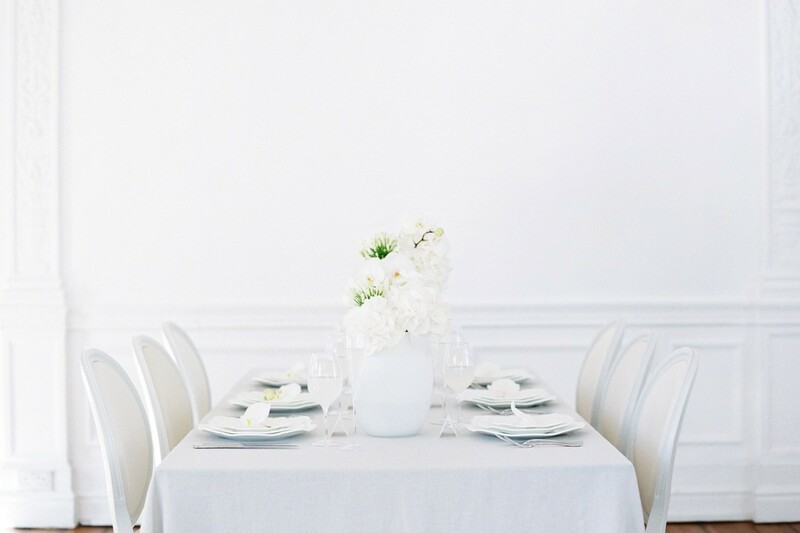 Working with an all-white palette can be quite a challenge! 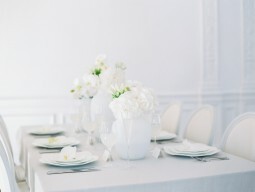 To keep it interesting, pretty and luxurious I incorporated subtly different white shades ranging from warm creams to cool soft greys, and different textures like linen and marble. 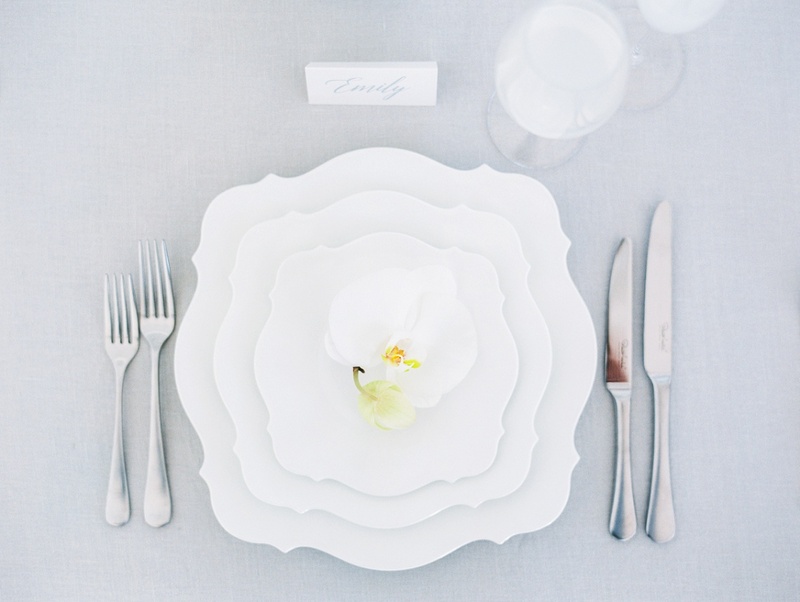 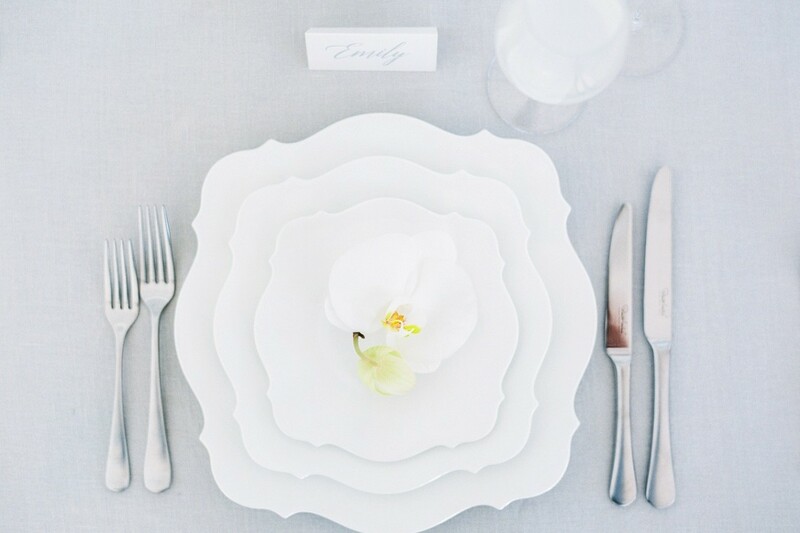 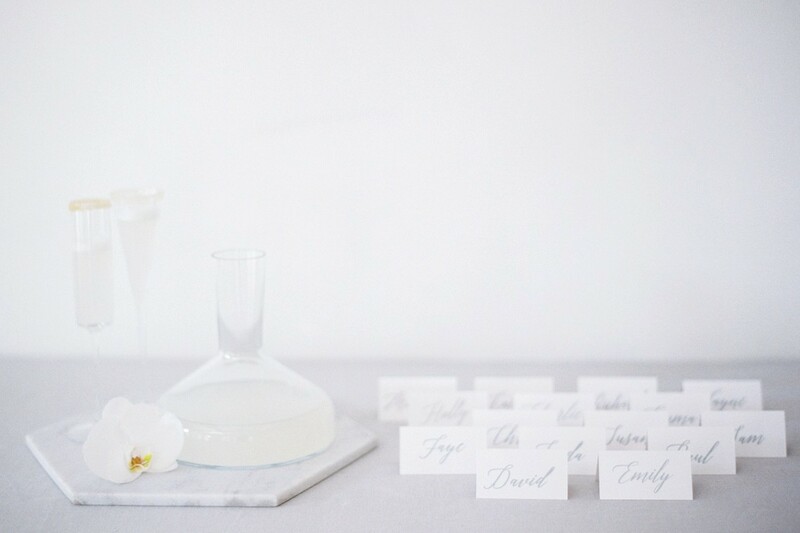 On the table, I chose to layer beautiful scallop-edged china with luxurious linens and elegant glassware from Prezola, finished with a single orchid bloom and a beautiful letter-pressed place card from Artcadia. 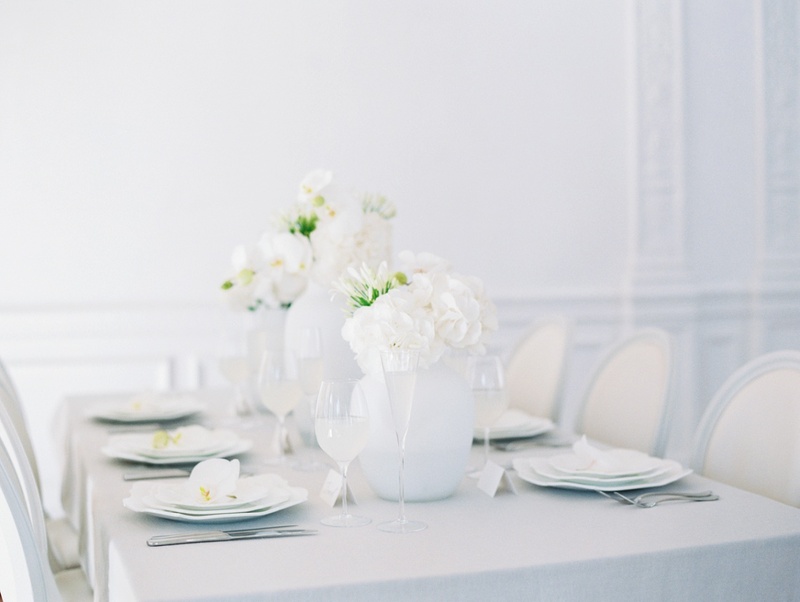 Statement chairs from Options added to the luxury feel of the shoot. Working with florist Jodie from Boutique Blooms, I chose a very limited selection of flowers in strictly white shades. 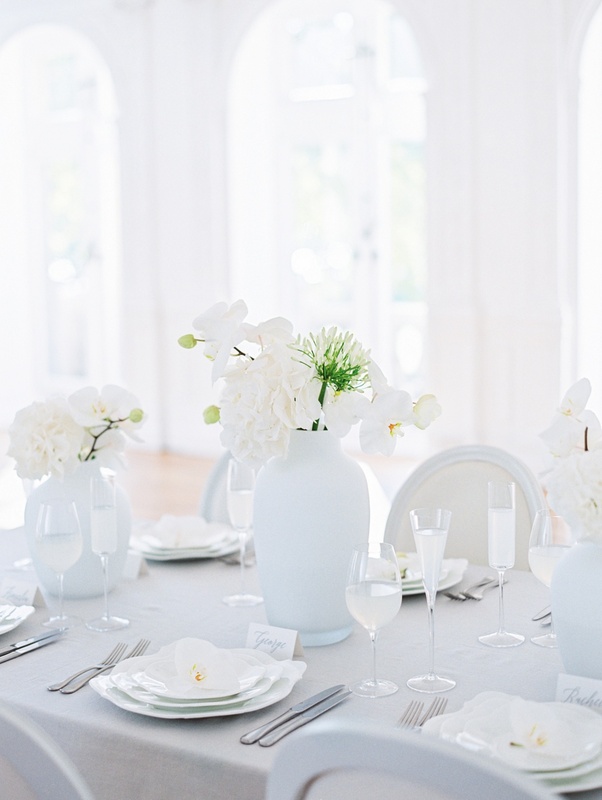 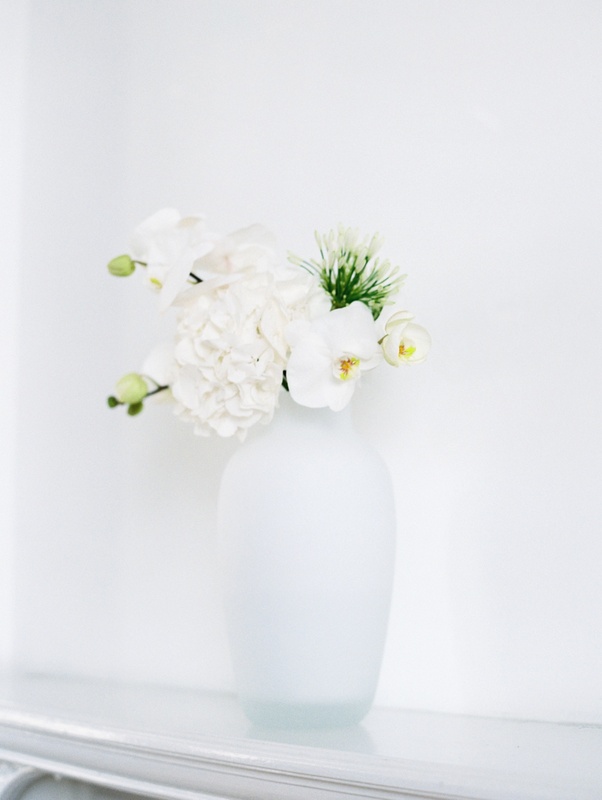 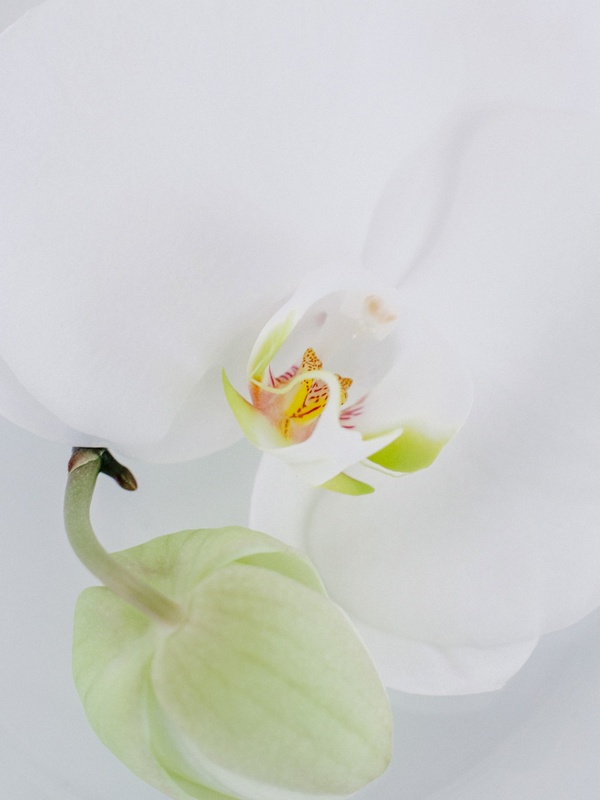 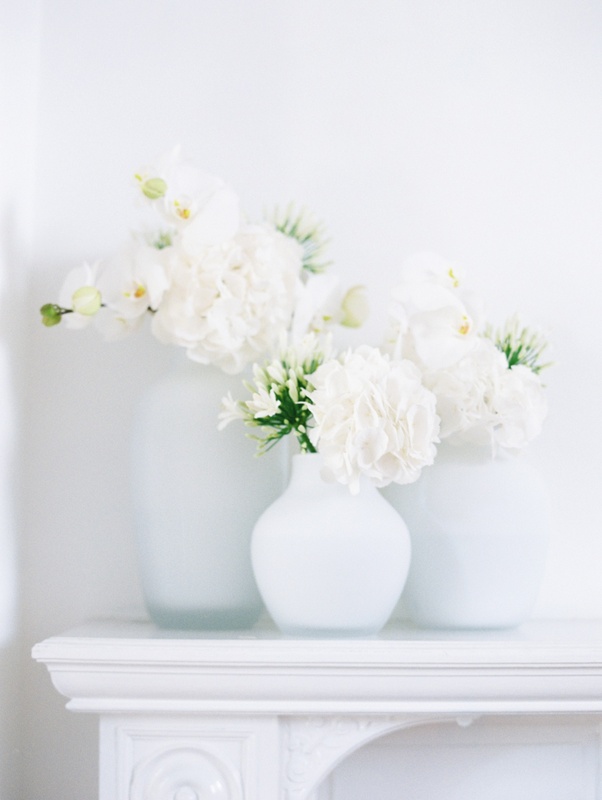 In oversized white vases, we placed a few stems of hydrangea and agapanthus with orchids, which create a strong, architectural look which is still pretty. 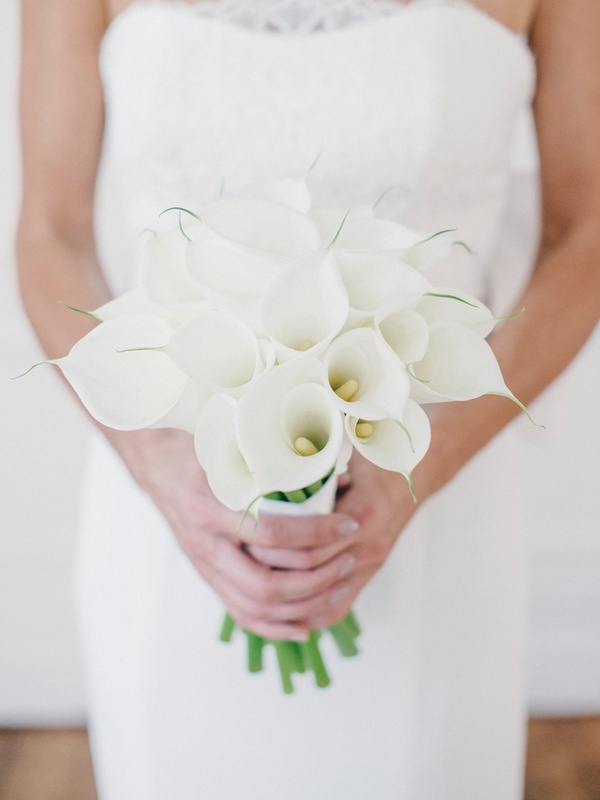 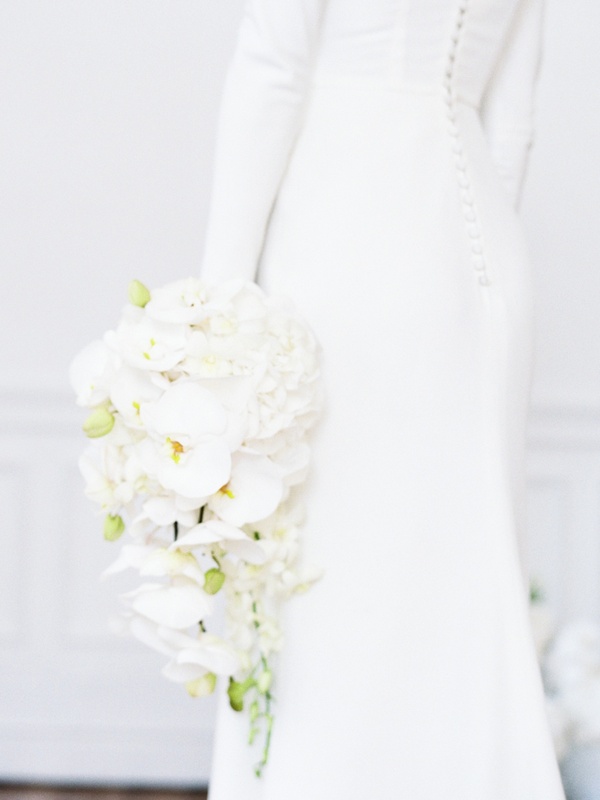 We chose to stick to one flower only for each of the bouquets – one of callas and one of cascading orchids. 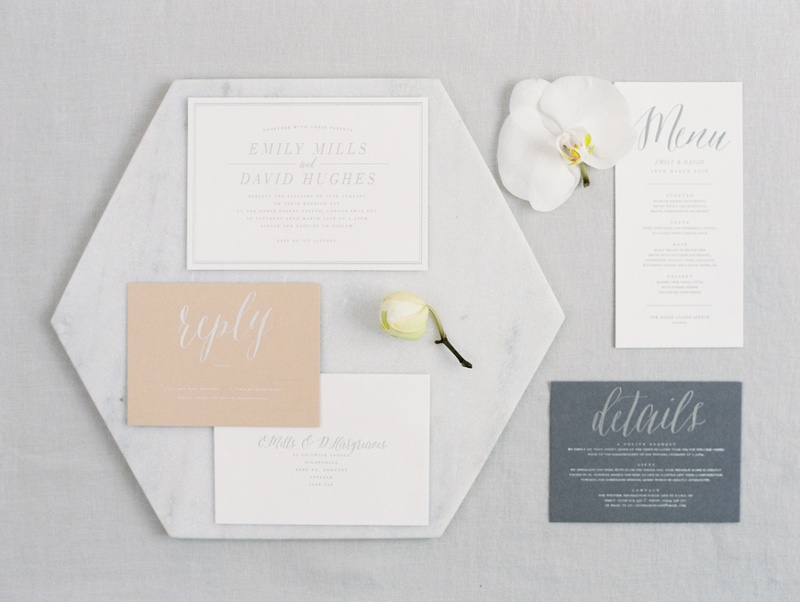 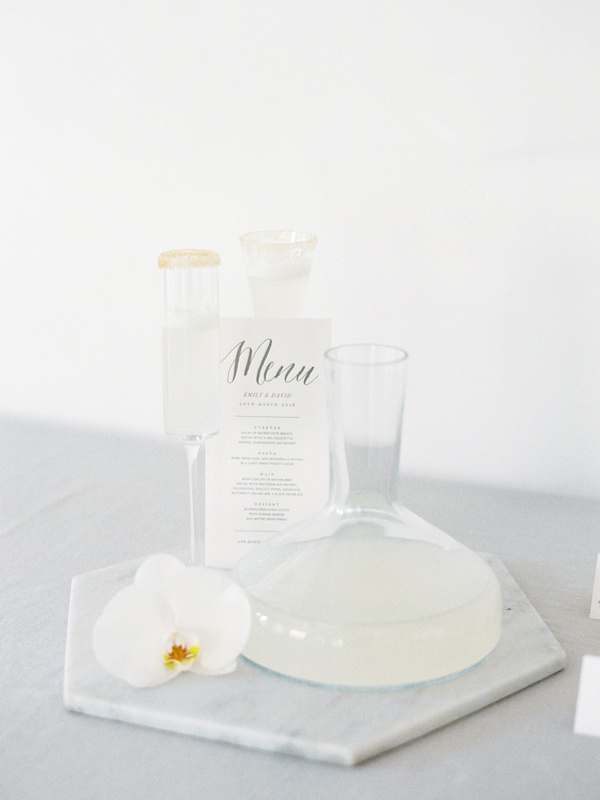 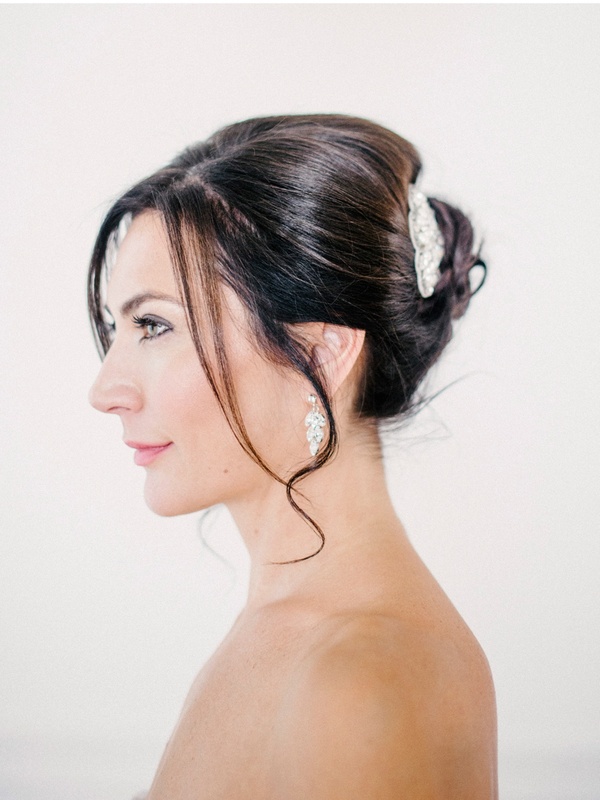 This is a great option for modern brides who want to keep the overall look clean and simple. 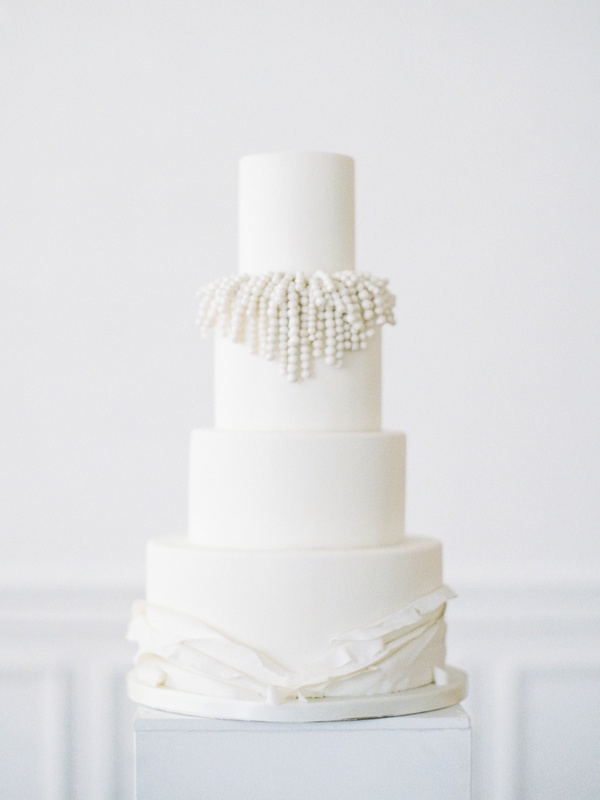 While the main cake, designed by Cakes by Krishanthi, picked up on the details from the brides dress with a cascading collar of beads, a smaller mini-cake was finished with a marble-effect and bow detail complimenting the colours and textures of the shoot. 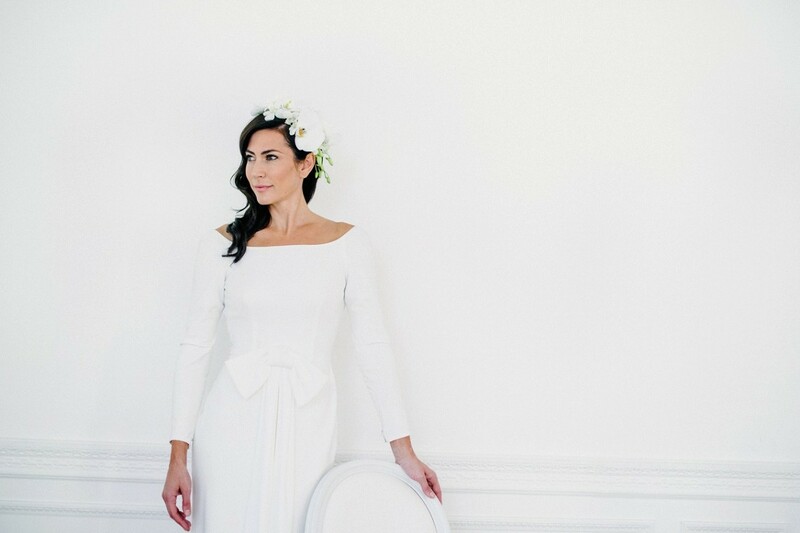 I chose two elegant, simple dresses from Blackburn Bridal, each with an oversized bow detail echoing the architectural nature of the floral design and details. 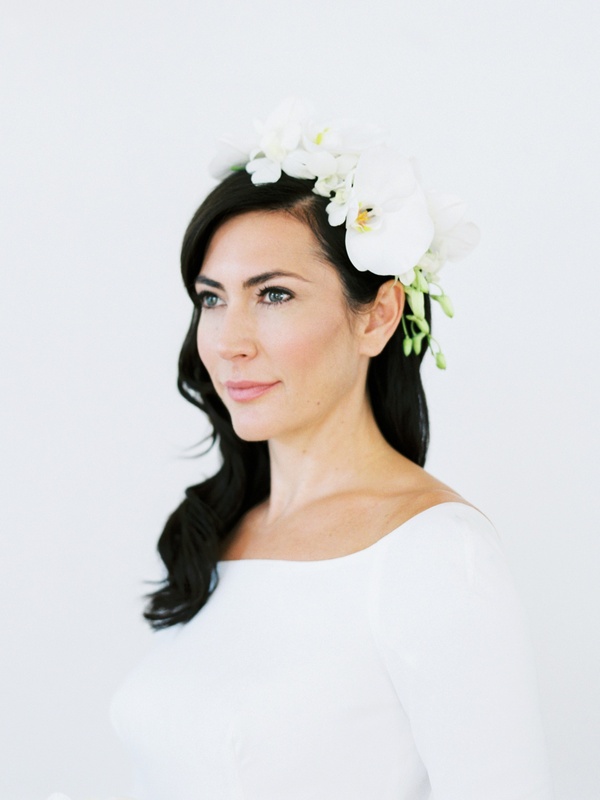 To compliment the long-sleeves and column style of the first dress by Jesus Piero, Jodie deisgned a cascading floral headpiece from orchids, and makeup artist Tori Harris created soft waves and smokey makeup perfectly suited to our understated city bride. 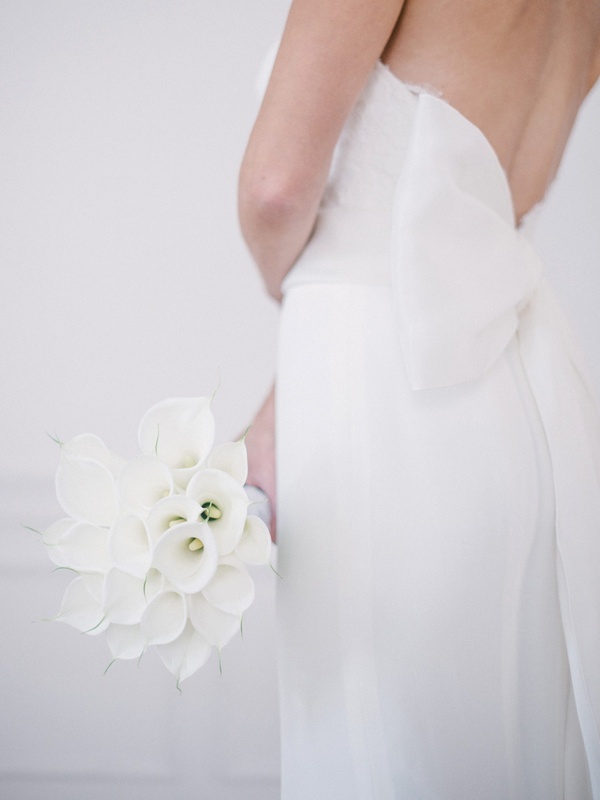 For the second look, I selected a more classic dress with simple lace detailing and a statement half-bow detail which adds real wow-factor to the back of the dress (imagine the oooh’s as you stand at the altar wearing this one!). 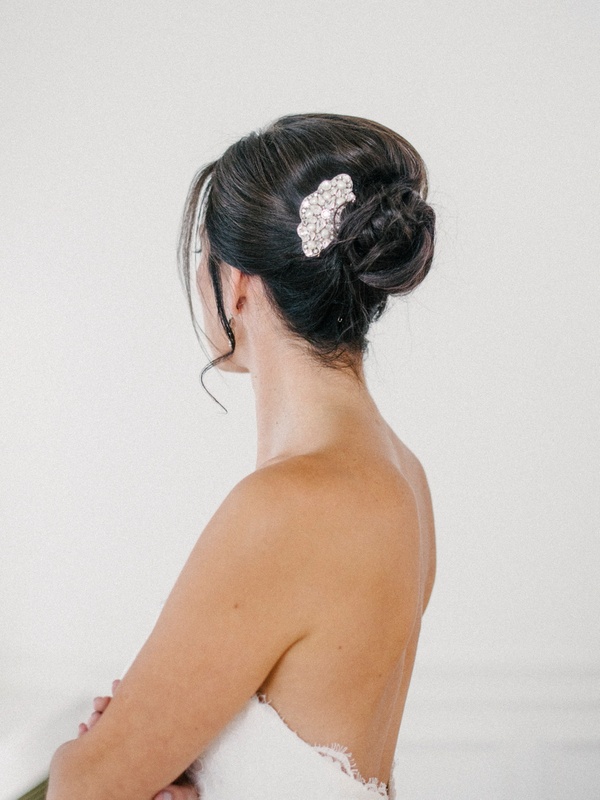 In keeping with the more classic look, Tori created an elegant bun accessorised with a pearl & swarovski comb by Victoria Fergusson Accessories. 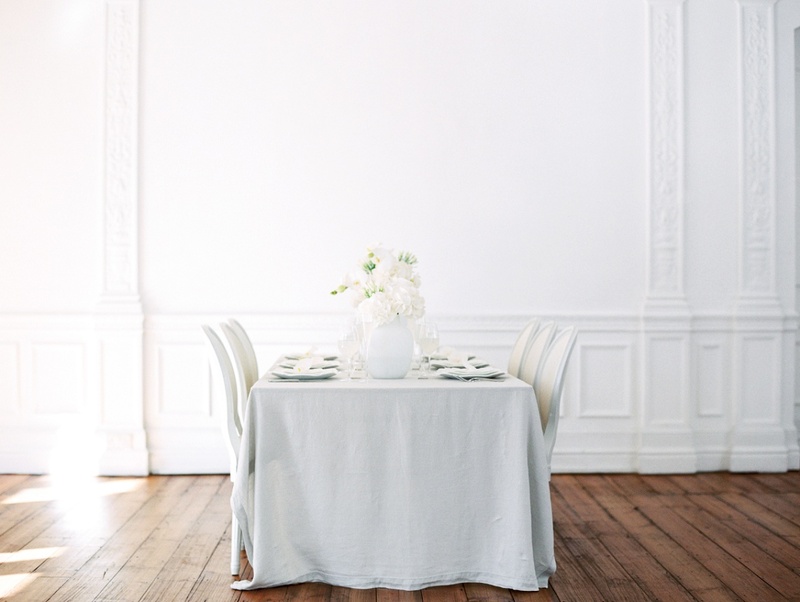 The key to nailing this stripped-back style is remembering that you need minimal detail – but each one must be executed perfectly!